Work on Carfree Design Manual is going well. I expect to send it to the publisher at the end of this year. The first draft is complete except for two chapters. I badly need someone to do for this book what Marti Frank did for the last one: help me with a major edit before final tinkering begins. If you have the (very rare) skills and are interested in this project, please send mail. Contributions to support the Carfree.com server have now paid for its operation for two full years. This support has made it clear that people find something of real value on this site. Thanks, all! Please see the Support Page for more details. Terrence "Lee" Zehrer paid for July through December 2005. Two anonymous donors paid for January through April 2006. The Introduction page at Carfree.com is now available in French. Thanks to Évan Monroig for the translation. Both the paperback and hardcover editions of Carfree Cities are widely available, although the hardcover is now in short supply. For details, see the Ordering Information page. Budapest hosted Towards Carfree Cities V in July 2005, the fifth conference in the series organized by World Carfree Network. This year's conference was well attended. Hungary's Clean Air Action Group did a great job hosting and organizing the conference. I would normally give a long summary of the conference proceedings, but this year I was busy most of the time with the maquette project and attended few of the presentations. The program and many presentations can be found at World Carfree Network's site. Bogotá's Fundación Ciudad Humana will host TCFC VI in September 2006. It now appears that New Orleans was substantially destroyed by Hurricane Katrina. The mayor has ordered the evacuation of the last residents. This event will cost more money than the attacks of September 11th, and the loss of life appears headed for similar levels. The question is what to do next. I first became familiar with New Orleans in the early 1980s in connection with some consulting work I was doing on flood issues. I like the city a lot, and the famed French Quarter is unique in North America. The present location is substantially below sea level and surrounded on all sides by waters that may rise to well above sea level, 30 feet or even more. Sea level rises, the lower Mississippi silts up, the southern lowlands erode, and climate change boosts the frequency and intensity of hurricanes. Eventually, this site will become uninhabitable. The time to move the city is now, not after the next flood. The interval to the next disaster will probably be shorter than the interval since the last (78 years). No conceivable amount of money can really protect this site from catastrophic flooding. Finally, the Mississippi River is overdue for a major course change that will take it 60 miles west of New Orleans, through Morgan City. This would end New Orleans' raison d'être: interchange port between Mississippi River barge traffic and oceanic shipping. The river has "wanted" to follow the course of the Atchafalaya River for decades, and the shift was already regarded as inevitable more than 20 years ago. Only massive expenditures on levees, flood control structures, and dredging have kept the river flowing through New Orleans. Unfortunately, as it now stands, the likely outcome of this tragedy will be to set the stage for the next one. This city will probably be rebuilt in its present location, where it will remain in harm's way no matter what else may be done. We should instead move New Orleans to higher ground, farther from the coast and the Mississippi River. The most suitable sites are probably on the north side of Lake Ponchartrain, which is quite a distance from the current location. Some functions, probably including the existing tourist industry centered on the romantic French Quarter, will likely remain in the current location. But suppose that the residential, industrial, and commercial parts of the city were to be relocated somewhere comfortably above the river and the sea. That would at last foreclose the disastrous flooding that regularly overtakes it. The Federal Emergency Management Agency (FEMA) is charged with managing these kinds of disasters and already has the statutory authority to relocate cities and towns out of the flood plain after catastrophic flooding. Whether or not this would even be considered in the case of a major city like New Orleans cannot now be said, but the possibility does exist. If New Orleans, a city of about 1.3 million people, is to be relocated, we should make the point that a new carfree city would cost less to build and emit fewer greenhouse gases than any alternative that might be considered. New Orleans, especially the old French Quarter, was arguably the most interesting city in North America. Its loss would be enormous, and perhaps some of the older sections, which are, quite sensibly, on the highest ground, can be preserved. But this really is not a good location for a major city. My thoughts are with the suffering people of New Orleans. The prolific Victoria Transport Policy Institute has issued yet another new study. This one considers the overall safety of public transit. It examines all risks including terrorist attacks. The study finds that transit is an extremely safe mode, with total fatality rates per passenger-mile approximately one-tenth the rate for automobile travel. The study ought to counteract a spike in perceived danger arising from the terrorist attacks in London this summer. Individuals should not overreact to the terrorist threat by changing their behavior in ways that actually raise their risk. Ken Livingstone, author of London's congestion charging scheme, is at it again. This time it's free public transport on London's buses for children under 16. The £70 million plan will accustom young people to using public transport before they learn how to drive. Ridership is expected to rise by 20% as a consequence. A smart card is required to obtain free travel, and misbehavior will result in loss of the privilege. Next year, the arrangement will be extended to include those under 18 and in full-time education. Livingstone said, "It is a gift by London to the younger generation so they can get out and about and explore this city. . . . This will continue London's move away from car journeys. It should also cut congestion, pollution, and accidents by reducing the school run." Kate Green of the Child Poverty Action Group said, "This is a radical step. Low-income families typically spend a much greater proportion of their income on transport and this move will directly benefit many of them." "London leads world by scrapping bus fares for under-16s"
Shanghai developed plans in the 1990s to rebuild the city almost from scratch. Bicycles were then the major means of transport, and planners sought to avoid the twin horsemen of the automobile apocalypse: gridlock and poisonous air. Huge sums were spent on bridges, elevated highways, and new metro lines. Today, however, Shanghai seems to have succumbed to the ravages of the car, and rush-hour gridlock is the norm. Affluence has brought with it an insatiable appetite for cars and oil. China's top environmental officials have warned of ecological and economic catastrophe if China does not change course. In large Chinese cities, cars now cause 70-80% of air pollution, yet it seems that nothing can stop, or even slow, the rising car culture. Car registration fees have doubled since 2000, to about $4,600, with little apparent effect. Shanghai built the world's fastest train, reaching the new airport in 10 minutes. The metro was extended by 200 miles. But still car traffic rages out of control, with the car fleet growing twice as fast as had been anticipated. Li Junhao of the city's Urban Planning Administration Bureau said, "The development of Shanghai has been beyond our imagination." Traffic flows expected in 15 years have been reached just months after new roads opened. Despite the heroic spending on public transport, results have been disappointing, due to a shortage of rolling stock. Rush-hour congestion on the metro is nearly as bad as on the roads, and metro patronage is running below projections. I have always said that public transport should strive to provide seats for all, even at rush hour. Is anyone listening? The real culprit is probably American-style consumerism, which equates car ownership with freedom, prestige, and success. "Shanghai Journal; A City's Traffic Plans Are Snarled by China's Car Culture"
Thanks for Carlos F. Pardo for picking this up. Germany established pedestrian zones in the centers of many cities during post-war reconstruction, and these areas became a symbol of Germany's economic recovery. Some of these places were simply streets blocked off to cars, but many of them were designed for the purpose, with fountains and green space. These areas have been the hearts of their cities ever since, but rot is setting in, or so some seem to think. For many Germans, these areas have been the place to go for as long as they can remember. Now concern is being raised about homeless people begging in the streets. "Junk and penny pincher shops are driving out long-established stores, with homeless people meeting in front of the town hall for their first beer at ten in the morning," moans Deutsche Welle. But since when did "penny pincher shops" drive out rich and profitable stores? What is really going on here? Pedestrian zones apparently still throng with shoppers on the weekend, but the buildings are showing their age, and the sterile architecture of the 1950s is dated. They are no longer "the place to go." The problem is apparently widespread. I think the cause is probably quite simple: as stores have become ever fewer and ever larger, they have abandoned the cramped and expensive quarters in the city center for big-box locations on the edge of town, a blight that has afflicted rich areas around the world. Here is a thesis topic for an urban planning student: what is happening to Germany's pedestrian zones, and why? "The Demise of Germany's Pedestrian Zones"
We should start at the realisation that Malta is just 17 miles long and Gozo a lot shorter. Most of our trips are within walking distance, if we remembered that we had legs, if it was safe to use them, if our roads were not a polluted menace to our continued existence. In the past few months I have taken to using a bicycle and rediscovered the pleasure of travel without parking problems. Flowing smoothly past the gridlocked in their expensive, wheeled ovens adds to the pleasure. It is a no sweat, no smoke vehicle because it is electric-powered. Most of the time I am embarrassingly early for my appointments because I allow myself the time I needed by car and forget about the fact that I am immune to traffic jams and have no time lost remembering where I parked the car or finding a place for it when I get to where I am going. Does the Halcrow Report consider the fact that bicycles make splendid sense in Malta? Was it asked to do so? How about pedestrians? Do we reward people who walk and spare us the pollution cost of transporting their backsides in the absurd overkill of a motor car? What are the pavements like? What precedence do they get over the polluters? Take any of our town bypasses; why are the pedestrians required to go underground? Why not motor traffic? Pedestrian underpasses are unpopular particularly with the elderly who are the most frequent victims when they avoid them. Has any local council or government body endorsed the Declaration of Florence setting precedence by pollution generation? Pedestrians first, then cyclists, then electric vehicles, then public transport and finally the irreducible private vehicle cohort. Would it really be so hard to do? If we really wanted to think big we could have a plan to make Malta Europe's only carfree country. Just the tourism advertising potential would be enough. We could if we wanted to. All the problems it involves all have solutions. Right now we spend far more money than it would take to address them all. What is the capital devoted to our precious 260,000 status symbols? At Lm5,000 apiece it works out as just over our national debt or Lm1.3 billion. Are we nuts? Well, there is at least one guy on Malta who is definitely not nuts. If instead of becoming obsessed with appeasing bus owners we took into account the health cost from extravagant air pollution, the cost of endless road maintenance, the opportunity cost of not being able to offer superb air quality to our guests and the cost of traffic-generated stress in our private lives, all the sci-fi alternatives would seem like an attractive rational choice. We could be planning an underground railway right up to Gozo by 2020 instead of just getting the buses to run decently by 2014. Public transport could be an exciting national topic for discussion instead of a national déjà vu just about buses. All I can say is, "Good luck!" "Seeing past the smoking buses"
The same company that brought us The Palm Islands, Al Nakheel Properties, have done it again expanding their portfolio of man-made islands with this latest Dubai island project shaped like the continents of the world. The World will consist of between 250 to 300 smaller private artificial islands divided into four categories - private homes, estate homes, dream resorts, and community islands. Each island will range from 250,000 to 900,000 square feet in size, with 50 to 100 metres of water between each island. The development is to cover an area of 9 kilometers in length and 6 kilometers in width, surrounded by an oval shaped breakwater. The only means of transportation between the islands will be by marine transport. Yes, it's carfree. No, it's not even close to sustainable. In this development, cars are replaced by boats. Or more likely by yachts. Large ones, with big, thirsty, noisy, stinking diesel engines. And, yes, this does show once again that those with the money to live anywhere they want will choose to live as far away from cars as they can. I have been calling for some time for the development of wireless trams (i.e., trams that do not require continuous overhead wires). I had overlooked the work of Parry People Movers. 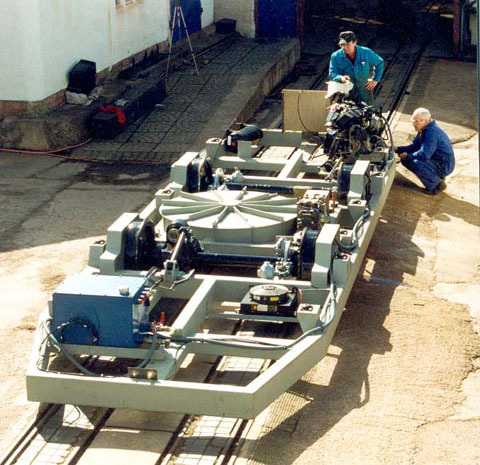 Parry has been building comparatively low-technology hybrid trams since the first prototype in 1991. 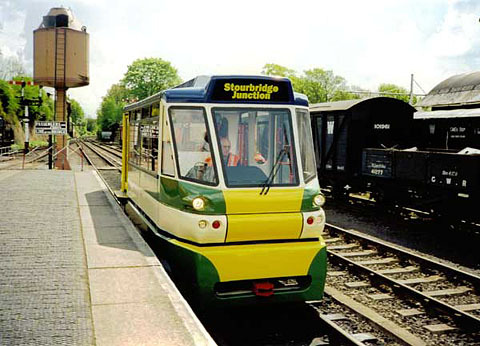 The vehicles have been operated at various narrow and standard gauge sites around the UK, mostly in test, but public service has been offered at Stourbridge. Service experience and reliability have reportedly been very good. Passengers often compare it to an electric tram, and sometimes wonder where the wires are. The tricks are light weight and a flywheel-assisted hybrid propulsion system that boosts acceleration and recovers braking energy. A small internal combustion engine provides all of the power. The usual conflicts between light-rail and heavy-rail practice have arisen, with safety concerns being dealt with on a case-by-case basis. Regulatory agencies everywhere are concerned about mixing light- and heavy-rail equipment on the same tracks. Germany has implemented systems where the two types of vehicles are always kept separated either in space or in time. Under the regulations of the Federal Railroad Administration (FRA), such operations are essentially impossible. Operational speed is limited to about 50 km/hr for the two-axle vehicles; a two-bogie version is under development with a maximum speed of 80 km/hr. 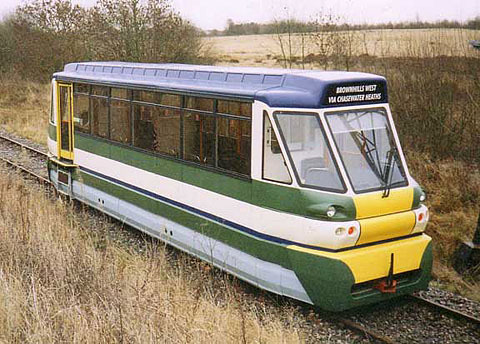 Acceleration is 1 m/sec, which is about the same as for modern trams, although it is considerably below the figures achieved by the famed PCC cars of 1935. A large, relatively slow-turning flywheel has been used in order to keep the technology simple. Parry claims that this makes for a robust, easy-to-maintain vehicle that is still efficient to operate. The vehicles have no electrical components whatever in the drive train. The technology was originally developed to improve public transport in African and Asian cities, and this is still the goal. At the same time, the use of a flywheel permits the recovery of braking energy and saves 30% on total energy use in short-haul service. While this vehicle must still be regarded as under development, it does appear that the major hurdles have been cleared. It is interesting to see someone finally focusing on the weight of rail vehicles. This problem was identified in 1920, but it seems that, except for the French TGV, little has been done, especially for urban rail. Thanks to Todd Edelman for picking this up. At the Tipping Point on Global Warming? Very bad news is coming out of western Siberia. The tundra is thawing, and, as a result, billions of tonnes of methane will be released in the next century or so. Methane is about 20 times as powerful a greenhouse gas as CO2. It is feared that this may be a "tipping point" event that will throw the climate into a permanently warmer condition. Recent surveys of the region found that the permafrost in an area of a million square kilometers has started to melt for the first time since its formation 11,000 years ago. The area is the world's largest frozen peat bog. Today, this once-barren expanse of tundra is becoming a broken landscape of mud and lakes, some more than a kilometer across. The thaw began 3 or 4 years ago. The changes are feared to be irreversible. The bare ground warms up more quickly than ice and snow, thereby accelerating the rate of thawing. Western Siberia is warming faster than anywhere else, having already warmed by 3C in the past 40 years. While methane has always escaped slowly from the permafrost, the majority of it has remained trapped. This one bog is thought to contain 70 billion tonnes of methane, about one-quarter of methane in the Earth's soil. The annual release from Western Siberia is expected to equal the rest of the world's wetlands and agriculture. This would double atmospheric levels of methane, leading to a significant increase in global warming. Other investigators have found damage to permafrost in eastern Siberia, where, at the hotspots, methane was bubbling to the surface so quickly that it was preventing the surface from freezing over. As if runaway melting in the tundra weren't bad enough, BBC's Horizon recently aired "Global Dimming," a report on the masking of global warming by atmospheric aerosols. The effects of these tiny particles, many of which come from fossil fuel combustion, are complex and varied. The grounding of all US air traffic for several days starting 11 September 2001 gave a unique opportunity to study the intensity of sunlight without contrails in the stratosphere. During the hiatus, daytime temperatures were higher and nighttime temperatures lower, precisely the effect that would be expected if the global dimming thesis is correct. Anthropogenic aerosols cause the formation of clouds that are unusually reflective, sending more incoming sunlight back into space. The aerosols are considerably smaller than natural cloud nucleation sites, which results in much smaller water droplets. Reflectivity depends on the surface area of the droplets, which is increased when they are small (for a given amount of moisture). Up to six times as many water droplets form in polluted air as in clean air. Improvements in particulate controls are actually reducing the strength of the dimming effect. (The health effects of particulates are large, and they must be controlled.) As the air gets cleaner, the shielding effect is reduced, causing temperatures to rise. The "pan evaporation" method of measuring evaporation rates is so simple and has been used so widely and for so long that the evidence of dimming is nearly incontrovertible. The upshot is that global warming may turn out to be worse than has been predicted. Warming by as much as 5-9C is possible. Global dimming has masked the increases already under way. As the air clears, greater warming will be noticed. "Why predictions about the Earth's climate will need to be re-examined." Britain's own supply of oil and gas will be nearly exhausted in about 15 years. Blair's government is now talking about limiting consumption, but the need for reductions is being couched in terms of limiting climate change. The Kyoto protocol requires the UK to cut greenhouse gas emissions 12.5% by 2012. Rationing is one strategy under consideration, and the ration might be in the form of a tradeable currency. The plan under consideration might be implemented in 10 years and would give each individual a "carbon card." Everyone would receive the same "personal carbon allowance." Points would be deducted every time the card holder purchased fossil fuel, whether directly or indirectly. High-energy consumers would be able to buy points from low-energy consumers. Implementation is expected to be expensive. Political hurdles are seen to be high, but the idea is still thought to have merit. I have long thought that a scheme of this sort, operated on a global scale, is the only fair way to allocate carbon emissions. This plan sounds like it could have a chance. Arnold Schwarzenegger (alias The Terminator) is rocking the boat again. The aging-movie-star-turned-governor recently unveiled a plan at a UN conference on global warming. The approach was simple: set goals for reducing California's emission of greenhouse gases. Other governors have since followed suit. Today, California will be a leader in the fight against global warming. . . . I say the debate is over. We know the science, we see the threat, and we know the time for action is now. Schwarzenegger has ordered the state's emissions of greenhouse gases to be reduced to year-2000 levels by 2010, to 1990 levels by 2020, and to just 20% of 1990 levels by 2050. The secretary of California's Environmental Protection Agency will oversee the effort and report on progress every six months. While Schwarzenegger announced no specific policies, he called for more efficient cars, a shift to renewable sources of electricity, and more efficient buildings. Not to be outdone, the California Assembly overwhelmingly passed a bill to meet international greenhouse gas reduction standards by 2010, a more ambitious target than even the governor's. California is the world's eighth largest economy. Its actions are important in their own right and are likely to influence the national debate. Bush ignored the five-day international conference, held in San Francisco. "Schwarzenegger unveils global warming plan at UN conference"
Thanks to Carlos F. Pardo for picking this up. 7.1. A "thing," not a point. A center is not merely, as the word suggests, a point that happens to be a center of some larger field. A center is an entity, if you like, a "Thing." It may be a building, an outdoor space, a garden, a wall, a road, a window, a complex of several of these at the same time. 7.2. Symmetry. In general, a center has some kind of elementary symmetry, especially bilateral symmetry, similar to that which the human body has, i.e., left-right symmetry, and an axis. This does not mean that all centers are perfectly symmetrical. But when an asymmetrical situation occurs, the centering process will generally try to construct the asymmetrical thing, or center, as a product of simpler centers which are themselves locally symmetrical. It does not permit random asymmetrical arrangements. 7.3. A center applies as much to space as to solid objects and buildings. Each center is thus a whole, which is made of subsidiary wholes. a. It is whole in itself, in an obvious, relaxed way, with its own symmetries. b. Its main parts are themselves also whole, and have their own symmetries. c. The space or buildings next to it, in so far as they are themselves whole, have their own symmetry. d. The whole is always part of some still larger whole, which is itself a center, possessing certain symmetries. e. Growth and symmetry. In the process of growth, it is rarely possible for a center to be perfectly symmetrical. In fact, as the world where the centers are growing develops, it contains more and more asymmetries, induced by a succession of necessary accidents. Sometimes these existing geometrical contexts are extremely peculiar . . .
Notice the strong emphasis on symmetry. I am not sure that this really helps all that much, but I have found nothing better to clear up this nagging question. 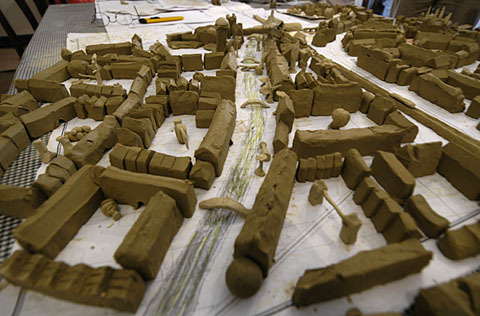 Participants in the Towards Carfree Cities conference built a maquette out of potter's clay. Construction lasted one day, and the evaluation continued during the next two days. The maquette depicted an area a few kilometers northwest of the city center. 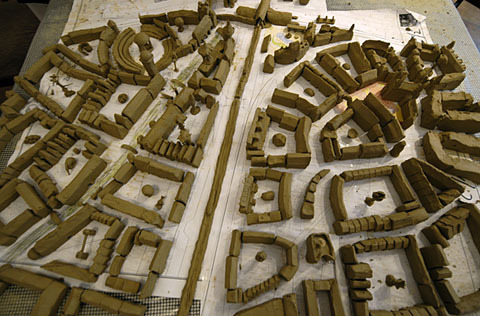 We hoped that the maquette might catalyze the building of an actual carfree district on the site, which was about half the size of the Reference District. The purpose of the exercise was to test theories that I have been developing. The construction of a clay maquette was the closest approach to a real trial that was possible. The lack of eye-level perspective at full scale diverged from the process that I will propose in Carfree Design Manual, but was otherwise consistent with it. We were able to test a number of hypotheses regarding participatory design, physical (as opposed to paper) design, morphogenic design, and medieval street arrangements. The process also verified the willingness and ability of laymen to design spaces that satisfy both the technical requirements of a carfree district and the aesthetic considerations I am laying out in the book. We also verified that people with some training can assist others in designing an urban area. 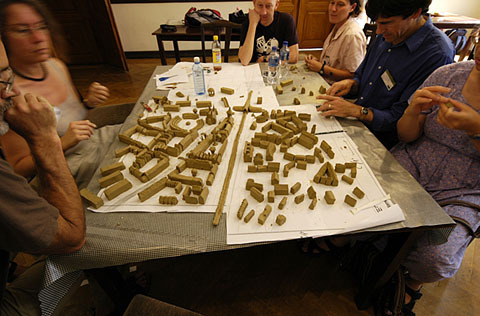 The Young Hungarian Greens (Zofi) sponsored the maquette and handled the tedious preparations. The site that we modeled was chosen at the last possible moment, but Zofi members were still able to obtain photographs and base maps at a scale of 1:500. The exercise was thus reasonably grounded in reality, even though urban planning had not even begun. About 18 people served as process facilitators and participants. I met with them a day in advance and outlined methods and objectives. I laid out my vision of participatory design and briefly presented the Reference Design. I also explained my advocacy for a return to a nearly medieval style of city design. During the building of the maquette, these facilitators helped others who participated and also did a lot of the actual work on the maquette. The site was farther from the city center than is ideal, but this is balanced by the crossing of two passenger rail lines. The eastern part of the site was unsuitable for redevelopment for various reasons, so we modeled only the western half, which contained a large drainage canal and the ruins of a Roman amphitheater. The entire site was very flat. The first task was to build an interchange station at the crossing of the two rail lines, which then formed an ideal hub for a carfree district. We quickly decided to reroute the existing, ugly drainage canal and change it into a tree-lined urban canal in the Amsterdam style. We left unchanged the passage of the canal beneath the rail line. Several people worked on possible alignments for the canal, marking the edges of the street/canal with buildings, until the proportions were both practical and attractive. The canal was then pencilled in, as shown above. The chosen route affected all further design in the northwest quadrant. We should have placed all of the existing structures that would be retained on the site before starting the design. Some work had to be redone once the influence of the ruined amphitheater became more apparent. Once the amphitheater had been completely modeled, a workable design for the main square (not far from the train station) emerged fairly quickly. An arcade was built to connect the small triangular square with the canal-side and helped to integrate the area. The amphitheater was connected directly into the square, so as to bring this historical feature back into daily use. The large bridge over the north-south rail line springs from just outside the edge of this square and is accessed through an archway in the base of a tower. I was particularly interested to test the application of morphogenic sequences. These were not formally stated at the start of the project, but they guided my thinking throughout the process, and the design approaches I suggested to the group were based on morphogenic unfolding. In this process, design decisions follow a specific sequence. It is understood that all elements that have gone before will influence everything that comes after. This is one of the fruits of Christopher Alexander's new The Nature of Order. In pure form, morphogenic sequences do not involve revisiting earlier decisions, but in this case, a few important decisions were taken again when it became evident that they had led to intractable problems. While I had not developed a full set of sequences at the time of the exercise, the work was well advanced. In fact, with this kind of direct 3-D design, morphogenesis arises almost by itself. Precisely as the sequences describe, the evident place to begin is with the major streets. Once these are in place, the next round of decisions, placement of the smaller streets, is self-evident. People quickly understood the need to build out from the center of the district and to work from the larger to the smaller elements. Almost every decision was influenced by what had gone before. The features of the site, even as limited in number as they were, exerted a profound influence on the design. It was clear that everyone understood just how great an influence the precise location of the canal would have on further design. I saw few design decisions that seemed to have been taken in the abstract, without reference to what had been built or consideration of the impact the element would have on the whole. I was very gratified by the unfolding of the process and impressed by the energy, enthusiasm, and creativity that the participants brought to it. 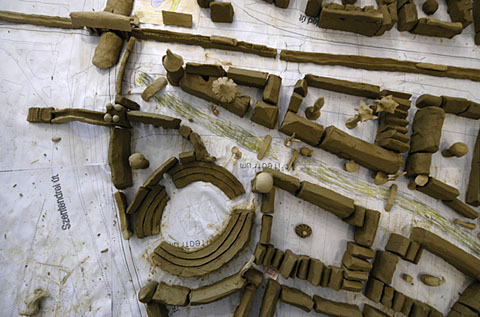 While it is not clear precisely what role clay maquettes may ultimately play in carfree design, the techniques we used merit consideration in almost any urban design exercise. Working in clay before working on the site may reveal issues that must be dealt with and clarify the prejudices and desires of the participants. The process demonstrated that citizens with little training are interested in city design. There was a good feeling throughout the day and the few conflicts that arose were resolved in a friendly and cooperative manner. Much innovation was brought to the task, and many solutions were adopted that never occurred to me but which were obviously superior. This one exercise alone was sufficient to convince me that no one individual should ever be entrusted with the design of an entire urban area. While it is not clear that large numbers of ordinary citizens must be included, I am now certain that better design arises when people work together to meet the challenges of a site. One concern that I have is the extent to which the process is simply a reflection of my own ideas and opinions. I am known to many of the people who participated in the process, and the nature of my work on this new book was also known. It could be argued that a different principal facilitator would lead to different results, perhaps very different. I suspect that I did in fact exert an appreciable influence on the process. Perhaps that cannot be entirely avoided, even though I made a concerted effort to draw out the ideas of other participants. Quite a lot of the work that was done on the maquette did not arise from anything I did. It became apparent that many of the participants did not have a clear notion of the scale at which we were working. Evidence of this was to be found in some elements that were added to the courtyards, particularly trees, most of which were larger than they would have been at true scale. This problem arose despite efforts to educate people before the start of the process regarding the scale at which we would be working and by passing around some examples of urban density, such as can be seen at Floor Area Ratios Illustrated. Rulers were available and frequently used to scale buildings. In a future attempt, I would prepare some sample blocks using buildings of various sizes and types, placing each set of samples in front of a group of drawings and photographs of similar real-world areas. The desire for trees is so strong that a stock of trees at scale should be available for placement. Trees should be of a material clearly distinguished from the clay by texture or color. Maquette-building makes for "good television," because it depicts people doing things, not just "talking heads," which are anathema to news producers. When the Hungarian evening news presented a segment on the conference, much of the footage came from the maquette process. I would like to thank the following people for their help in building the maquette in Budapest: Ed Beale, Anna Bonifert, David Brasfield, Manuel Costa-Lobo, Ágnes Drechsler, Todd Edelman, Elvan Bürge Erginli, Mária Farkas, Hajnal Benedek, Markus Heller, Michael Hermann, Róbert Horváth, Justin Hyatt, Edit Jagodics, Mari Jüssi, Róbert Klujber, Selcen Kolutek, Bence Kovács, Nóra Kovásznai, Gabriella Magyar, Steven Melia, Mária Molnár, Meltem Parlak, Alex Pollock, Demet Savasan, Silke Schilling, Fulya Toper, Sebastien Torro, Szabolcs Tóth, Kevser Üstündag, Elif Üzmez, Gus Yates, Murat Yildrim, and Janneke Zomervrucht. The Young Hungarian Greens, many of whose members participated in the design and construction, were indispensable to organizing the project. A group of urban planning students from Istanbul were also very active, under the leadership of their professor, Kevser Üstündag. Catherine Ng, Chair, "Hush the Bus"
Today, consumers enjoy a wide range of choice of products and services. Getting their attention is increasingly difficult because, one, people have learned how to screen out the rising barrage of ads, and two, people are using different media: radio, TV, print, internet, mobile phones, and so on. Having achieved power, consumers will not give it up. . . The market will get more fragmented, customers' needs will get more diverse, and sophistication and empowerment will continue to grow . . . As marketeers adjust to this new environment, advertising may well have to become more permission-based. This sounds comforting for consumers who loathe unsolicited ads. Many people do not trust advertising and have found ways to shut their eyes and ears to it. During commercial breaks on TV, they mute the volume. They fast-forward ads in taped programs. They skip advertisements in newspapers and magazines. Consumers can now compare products by studying the specifications provided on numerous informative websites. But that does not mean advertisers do not try their hardest to force commercials on people. Consumers are still inundated with junk fax, junk e-mail, junk pop-ups, and junk text messages on mobile phones. Perhaps the most egregious violation of "permission-based" advertising is on-board TV on public transport in Hong Kong. Hong Kong has a population of seven million crowded into just 1,000 sq km of land, with the large majority of people on Hong Kong Island and the Kowloon peninsula, which total just 125 sq km. In the most densely populated districts there are 50,000 people per sq km. About half of the population take public buses everyday. In 2001, all three bus franchises installed TV screens on their buses: two on the upper deck and two on the lower deck. Loudspeakers line the two sides of the aisle on both decks. Franchised buses now broadcast an assortment of advertisements and "infotainment" programs. Bus TV contents, called "RoadShow," are produced by a subsidiary company of the largest bus franchisee. The one-hour program is repeated throughout the day. There is no choice of program, no on-off switch, and no volume control. Bus TV drives many passengers insane. You live in the suburb and work in city center. You take the bus every day to and from work, 45 minutes each way. On traffic jam days, the bus journey is half an hour longer. During the day, you make two more 15-minute bus journeys for to a meeting. In the morning going to work and in the evening heading home, most bus passengers are either catching up on their sleep or reading. The bus is quiet except for the TV noise that blasts over the air-conditioner and engine noise. During the day, buses are less crowded but noisier because many passengers are either chatting to friends or talking on their mobile phones. With TV noise, they have to shout to be heard. What you really want is peace and quiet, but instead, you are forced to repeatedly watch and listen to snippets of raucous MTV, movie trailers, TV hosts chit-chatting, mind-numbing commercial jingos, dreary government announcements, politicians babbling away, and advertisements ad nauseam: bras, slimming products, whitening face masks, and so on. On buses, you are what RoadShow calls a "captive passenger" to advertisers. The aim of advertising is to get your attention. What better way to get your attention than screaming at you via loudspeakers? By definition, bus franchisees do not operate in a free-market structure. They are monopoly operators of routes given by the government. Passengers have limited choice when it comes to public transport - they cannot vote with their feet. This is why the transport regulator must do its part in prohibiting coercive TV. Unfortunately, the Transport Department in Hong Kong claims that bus TV is a kind of "value-added service," and has refused to ban bus TV. It is depressing that the franchise regulator buys hook, line, and sinker into RoadShow's blurb that it is providing a much desired "service" to customers. Everyday 3.5 million Hong Kong people travel by bus. Bus TV is a blatant advertising machine that repeatedly broadcasts an hour of commercials disguised as infotainment. Permission-based advertising is a far-off dream when the regulator colludes with business sector. Every effort must be exerted to expose such collusion, which erodes consumer rights. using bus TV as a case study. same "service" to the busiest stations. Ed. Erik died in a hiking accident in Sequoia National Park this past July. He was an early supporter of the carfree movement and a towering intellect who brought his mind to bear on a wide array of problems both scientific and social. While his actual field was theoretical ecology, he turned his hand to many things far outside his nominal field, as can be seen from a list of his papers. In 2001 he led an effort to redevelop the North Point site near downtown Boston as a carfree district. While this attempt ultimately failed, the work that supported it was important in developing our thinking on carfree design. His review of Part I of my forthcoming book was invaluable. He was a linguist, musician, writer, and computer programmer of great ability. His commitment to peace and justice is clear from an editorial he published in April 2003: Iraq: The Short Run and The Long Run. He pioneered the development of artificial-life software while still a Freshman at Yale. He helped start Terrashare and MetaCarta, two companies that forged into new territory. He was a loyal friend and unmatched intellectual sparring partner of deep and abiding curiosity. His was a unique presence in the lives of many people. He will be missed. While our ultimate goal is to create cities without cars, in the meantime, we may be able greatly to reduce the role of cars in cities, and the amount of space they are allowed to consume. A new book from, surprisingly enough, The American Planning Association, offers information and guidance in recreating our cities to de-emphasize cars - and often generating sizeable revenue in the process. Don't be intimidated by the length of Donald Shoup's The High Cost of Free Parking (Chicago: American Planning Association, 2005). It is long (about 600 pages, plus over 100 of appendices and references), but that's because it is packed with useful information and notes. Shoup is meticulous in documenting his claims, and a sense of humor makes the book not only a useful reference, but an interesting read. His main point, as the title shows, is that "free" parking is anything but free. In the US, and in many other cities, parking requirements for different buildings are based on estimates of peak demand for free parking. Not only does this mean that most parking lots are partly empty most of the time, but consumers are being given a false choice, as they are not paying directly for the cost of what they request. As Shoup points out, the peak demand for free anything is meaningless - so why do we rush to provide it for parking, but not for free desserts, or even affordable housing? Since the cost of parking is bundled into the cost of everything else, other prices go up. People perceive parking as free, and thus the cost of parking does not deter anyone from driving. He then illustrates in a number of ways how this has disfigured different cities, led to outrageous costs for housing, and skewed our priorities so that we offer more space for cars than for employees, students' classrooms or playgrounds, residential parks, and so on. For instance, "a car parked at work typically occupies about a third more space than its driver does", and some schools in Los Angeles offer only 15 minutes of recreation a week for the students, partly because the playgrounds have given way to parking lots for the teachers' cars. Some of the many parking-related issues Shoup covers includes the size of the problem, problems caused by free parking, advantages to charging for parking, how free parking affects transport decisions, efficiency and equity (how the poor subsidize parking for the rich), how markets can help resolve the problem (developers almost always would prefer to provide fewer parking spaces than required by zoning codes), how parking affects business, the concept of public space, parking and the environment, and space demands and cost. "Bundling the cost of parking into higher prices for everything else skews travel choices toward cars and away from public transit, cycling, and walking. Off-street parking requirements thus change the way we build our cities, the way we travel, and how much energy we consume. All the required parking spaces use up land, spread the city out, and increase travel distances. " Shoup also offers specific suggestions to remedy the ills. While many may object to his seeming friendship with the car, and acceptance of its place in US society, his recommendations are intended to motivate people to use transport other than the car, and to create cities that prioritize other space needs above the car. Charging market-based prices for parking that kept a certain percentage of parking spaces open would, he suggests, prove even more successful than congestion tolls on roadways at reducing car use, and the revenue could be used to improve neighborhoods - for instance, by fixing sidewalks and planting trees, thereby making the environment more conducive to walking and cycling. Shoup obviously also intends his book to be widely read by city planners, who might put down a book that openly declares war on the car. Although the book is mostly about the US - Shoup is himself a professor of urban planning at UCLA - the book does include information about other countries, and specific suggestions for mayors from cities in the so-called developing world. "The curb parking revenue is thus not like a tax that transfers revenue from motorists to the government, but is instead a fee that reduces the motorists' time-and-fuel cost of cruising by as much as it increases their monetary cost of curb parking. The net burden on curb parkers is therefore zero because motorists save on cruising what they pay for parking, and the reduction in private waste is converted into new public revenue." I personally hope that Shoup's book will create a revolution in city planning and zoning codes, with planners finally understanding the harm done by their baseless requirements for off-street parking, and reluctance to charge market prices for street parking. For all of us who care about freeing our cities from cars, Shoup's book is a vital tool. Shoup's book can be ordered at: the APA store, and an on-line summary is available at: WBB Trust. The next issue of Carfree Times is scheduled for early January 2006. Carfree Times is published quarterly at Carfree.com. To receive e-mail notices of new issues, please visit the subscription page or send e-mail with the word "Subscribe" in the subject line. We do not share our mailing list. Interested in writing for Carfree Times? We welcome articles on a wide variety of subjects, and offer an opportunity to publish letters to the editor and guest editorials. Drop us an e-mail. In this day of corporate-influenced media, it is perhaps incumbent upon Carfree.com to declare its ownership and sources of support. Carfree.com is wholly owned by Joel Crawford, the legal name of author J.H. Crawford. Its operation is financed by J.H. Crawford, with the help of some generous donors since 2004. It generates no revenues directly but does help support sales of Carfree Cities. Carfree.com accepts review copies of books but makes no commitment to review them. J.H. Crawford receives no commissions from the sale of books mentioned on Carfree.com. The views expressed at Carfree.com are those of J.H. Crawford, except for articles, letters, and editorials that carry the names of other authors. The inclusion of these signed texts is at the sole discretion of J.H. Crawford, who does not necessarily agree with the views expressed. All other content, except quoted material, is written by J.H. Crawford. E-mail announcements of new issues of Carfree Times are mailed to approximately 800 subscribers. This mailing list is not shared for any purpose. A rough estimate of first-year circulation for each new issue is 5000. Carfree.com as a whole serves 1.5 million pages and about 140 GB a year. Thanks to Chris Miller for proofing this and previous issues of Carfree Times.